Introducing the XD-S. This slim, powerful addition to the XD line delivers all the performance of a .45 expertly engineered to fit in any size hand. At only 1 in wide, the XD-S fits as perfectly into your concealed-carry strategy as it does in the palm of your hand. Prepare to be impressed with the single-position Picatinny rail that puts lights and lasers within easy reach. With an eye toward detail, the low-profile rear and fiber-optic front sights are specifically designed to allow you to quickly zero in on your target. 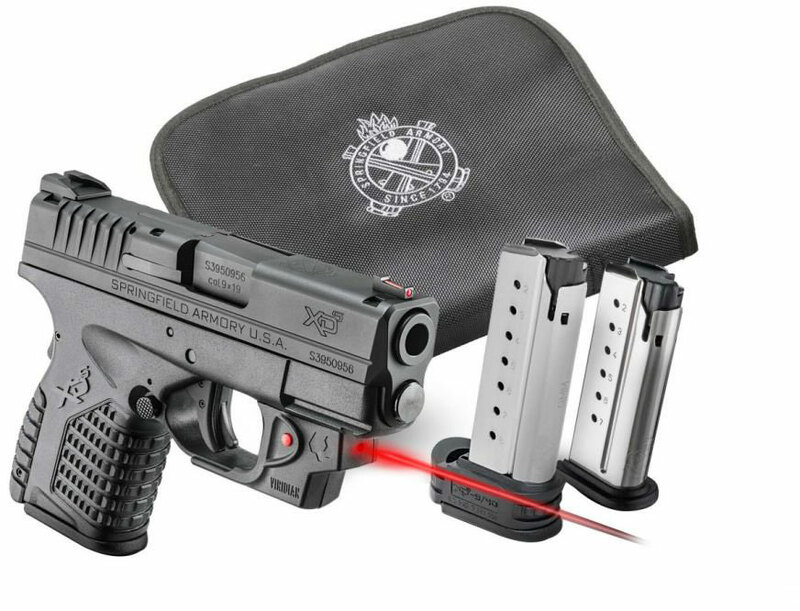 This powerful pistol includes the Ultra Safety Assurance (USA) Action Trigger System, loaded chamber indicator, two mags, viridian red laser, and a soft case. In addition, the XD-S offers a top-of-the-line, enhanced secure grip texture for greater control and usability. The XD-S disassembles just like the XD, however, with the XD-S, the disassembly lever cannot be manipulated with a magazine in the pistol. Additionally, when the disassembly lever is up, a magazine cannot be inserted into the pistol.